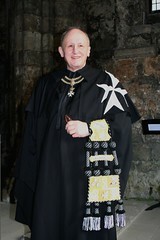 'Fra Freddie' was at different times Chairman of Una Voce Scotland and President of the International Una Voce Federation; at the time of his death he was Grand Prior of England, of the Knights of Malta. He was also a major benefactor, through one of the charitable trusts he was involved with, of the St Catherine's Trust Summer School. An indefatigible worker for the Church's traditions, and for the corporal works of mercy for which the Order of Malta was founded. More on the Una Voce Scotland connection; the Una Voce Federation connection, and the Order of Malta connection.